Appearance: Nami Williams is a young, normal-sized and skinny girl, with orange hair and light brown eyes. Many people consider her to be very attractive or even beautiful. She has a blue tattoo on her left shoulder, which represents mikan, and pinwheels, where she used to have a tattoo. She also has a scar located on her left shoulder as well, above the tattoo, wich came from a dinosaur attack. Personality: Nami is an adventurous young woman who loves to search for valuble treasures. She is a very friendlly woman to get to know & she is a really smart young woman, too. She tends to be a party animals & LOVES to drink rum, as it is tied to the pirate-self in her. She also loves nothing more than a good dinosaur fight for fun as she has quite a few, herself. She is also the flirty type of woman, as she loves flirting with men. Biography: Nami was born in an average family, where she was an only child. But all that changed when her parents adopted a sister for her as they couldn't have anymore children. 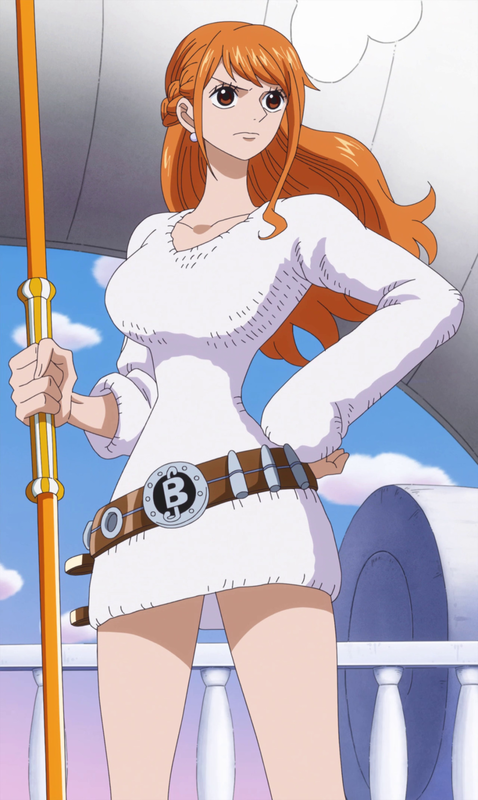 They eventually named the adoptive sister, Katie Williams (who, later on is nicknamed "Starfire").Nami loved to teach Katie & help her with any troubles. One day, she had a dream of becoming a great adventurer to search for valuble treasures. So after high school, she became, what she beleives, was a pirate! But she was the good & friendlly type as she hates violence. She only makes these adventures as it takes her mind off of boredom at times. She would also often to be known to drink big amounts of rum & get drunk at wild parties as she became a party animal. But one day, dinosaurs were introduced to the world, & so did the JFC tournaments! She then had another goal set before her, get her & her sister some dinosaurs & enter! As they searched, Nami stumbles on an island in the middle of the Pacific Ocean that was abbandoned by people & found out there was dinosaurs on it! She tried to get one from here, but she learnt the hard way as she got into a fight with a full grown, wild Deinonychus! She had a sword & fought, slashing one of the dromeosaur's eyes out! But not without paying the price! The raptor at one point slashed her left shoulder, causing her to bleed out a little. She was then tooked to a hospital where she had 100 stitches put on the slash wound to heal it. But this injury didn't stop her on her goals & dreams! Now, that slash is a scar on her shoulder above a blue tattoo. Now, she awaits more adventures with her sister & aquired dinosaurs & hopes on finding more valuble treasures & entering the JFC tournament one day.